"Juvenile concerto" is a peculiar expression used to describe the first concertos by Rachmaninov, Prokofiev, and others. This was to signify that these works were written at a very young age. Although Kapustin's age at the time of the composition of his first two piano concertos (1961, 1972) was hardly youthful, this epithet could be applied to them too, since the important thing is not the composer's physical age, but his level of inexperience. When he now looks through the score of the second concerto, the thought that invariably comes to his mind is "How could I write the piano part in such a clumsy way? And why is the harmonisation so straightforward, without any spark of ingenuity?" But when he listens to the recordings, his attitude becomes more tolerant, even favourable: the simple fact is that since that time the style of his music has become very different. How did Kapustin decide to write another piano concerto (there are six of them now)? When he was still working in the big band led by Oleg Lundstrem, three themes occurred to him: the secondary theme of the first movement, the melody of the andante, and the rondo refrain (from the finale). In addition he was eager to try writing for strings for the first time, not just for big band as before. He realised his plan slightly later, when he was already working in the State Radio Orchestra and had both big band and string instruments at his disposal. The composition of this concerto was the reason he was admitted to the Union of Soviet Composers; later, in 1980, he even performed it in the Tchaikovsky Concert Hall in Moscow. The concerto has three traditional movements: a sonata allegro, a three-part andante, and a rondo which sounds like a perpetuum mobile, although the solo part has many pauses (it can also be thought of as a toccata). The first and last parts of the andante have a peculiar metre: although it is the standard 8/8, the way these eight beats are subdivided is rather uncommon: 3-2-3. This second concerto is not at all challenging from a technical viewpoint, but when one listens to it, it seems incredibly hard. Kapustin recorded it for the Soviet Radio Archive. Ellen asks: Did Kapustin ever transcribe concerto no. 2 for one piano soloist with orchestra? asks: I want to listen to it. There are several performances including one with visuals on the score. Paul asks: Where can I find the full orchestral score for this concerto? Sarah Rodgers answered:The full score and performing parts are only available to hire, not purchase. You will need to refer to the publisher. 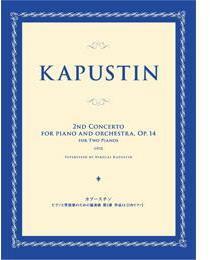 What do you want to know about Kapustin, Piano Concerto No 2 op 14?